A Call for Evidence launched today (10 June) will enable a wide group of people to have their say on ways to crack-down further on Organised Crime Groups (OCGs), who profit from waste crime. "Organised criminals running illegal waste dumps and fly-tipping are blighting local communities. They cost our economy vast amounts of money, pollute our environment and harm our wildlife. "We must crack-down on these criminals who have no regard for the impact they have on peoples’ lives. The time is right for us to look at how we can best tackle these antisocial and inexcusable crimes." • Make recommendations for a strategic approach to serious and organised waste crime. "Organised crime groups exploit any opportunity to make money. Our local communities are being scarred by the illegal dumping of waste, while at the same time people are being conned into placing contracts with dodgy waste firms. "We are committed to ending this scourge and I look forward to exploring what more Defra, local authorities, the private sector and police can do on this issue." 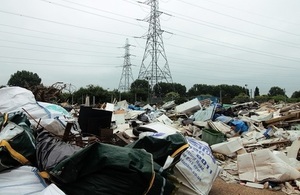 A study by the Home Office suggests that criminals may also use waste management activities such as operating illegal waste sites as a cover for crimes such as theft, human trafficking, fraud, drugs supply, firearms supply and money laundering. Review chair Lizzie Noel has more than 20 years’ experience of senior roles in both the private and public sectors. She will engage with a wide range of stakeholders, and the Call for Evidence will enable a wider group of people to have their say. "The health of our communities, environment, and economy is being harmed by organised groups committing serious waste crimes. "This review is an opportunity to properly understand the extent of this criminal activity, and I look forward to working with a range of partners to ensure our response is robust and effective." Since 2014, the Government has given the Environment Agency an extra £60million towards enforcement work to tackle waste crime. This extra investment has shown a return of about £5 for every £1 extra spent. Today’s announcement builds on a range of new measures from the government to tackle waste crime, including new powers for the Environment Agency to lock the gates to problem waste sites to prevent waste illegally building up and powers to force operators to clear all the waste at problem sites, and extending landfill tax to include material disposed of at illegal waste sites with effect from April 2018. "Last year, we closed down two illegal wastes sites a day and were granted new powers to complement our existing enforcement efforts. Our officers are also out in communities, preventing and disrupting criminals through our intelligence led investigations, and also dealing with the consequences of illegally dumped waste to the environment and the wider community. "We welcome the opportunity to review how best we deploy our resources and strengthen ties across government and with the police to target organised criminal rings behind illegal waste operations, and bring perpetrators to justice." The Government has also recently given councils powers to hand out on-the-spot fines to fly-tippers, made it easier for vehicles suspected of being used for fly-tipping to be stopped, searched and seized, and later this year will introduce new fixed penalty notices for householders who pass their waste to a fly-tipper, subject to Parliamentary approval. The review is due to be completed by September 2018.